Rona Taylor; Janet Hickinbottom; Faith Ward; Andy Gibbs; and Mary Webb. Terry Heyes arrived later in the meeting. Apologies had been received from Marlene Hills; Judi Hibberd, John Nisbet and Cllr Archie Taylor. The minutes of the last meeting of January 15th 2013 were accepted. All other matters were to be covered by the agenda. The amended constitution had been circulated and as there were no further comments it was accepted as the final constitution. A draft response had been circulated for comment and had since been submitted. This event had been a huge success and exceeded expectations with 42 people attending. Special thanks were extended to Diane and Bernard Swindells for all their hard work and support. An excellent presentation regarding St David's day had been produced by Beryl Pollard. A profit of £80 had been made, even though it had not been planned as a fund raising activity. Mary reported that the profit was to be added to grant funds towards more catering equipment for use in the village hall. Further applications had been made to buy a plate warmer. Further applications would be made to the community forum in the future. Diane had drawn up a list of equipment needed. This was now installed. The Village Hall committee had agreed to purchase a “break the glass” container for the key. Signs highlighting the position of the defibrillator had been put up at the Peeping Tom, the school, on the Greenway as well as at the Village Hall. A number of residents had attended a full day general first aid course in the Village Hall. There was still enough money available from the grant to purchase new batteries for the defibrillator when required. Terry reported that the formalities had been sorted out. All volunteers were cleared to operate the equipment. A template was being sent around the team to find out availability and sort out a rota. Terry would co-ordinate with John Whitehouse. The equipment had to be calibrated before and after each session and Terry was arranging for this to be done at Arnold’s Farm. Terry felt they needed one more monitoring site. Rona said an appeal was to be heard. Both the Parish Council and the Residents’ Association had sent in responses. It was felt the premises were not generally perceived as a caravan site and so change of use permission would be needed. Cllr Ian Cox had included his views from the legal aspect. Janet had circulated a number of options with different costs. Some additional questions were posed and Janet would seek clarification in time for the next meeting. The second option was considered the best choice at a cost of £1000. However, there were currently insufficient funds for this and so this project would be put on hold for the present. Kathryn reported that the draft Plan was going well. A meeting was planned with a representative of Warwickshire Rural Communities Council (WRCC) who would advise. It would then be sent to a small group to trial. The challenge would be delivery and completion by residents and it was hoped members of the committee and others would take responsibility for 10 houses each. Responses would need to be professionally collated and again WRCC might assist with this. Thanks were expressed to Kathryn and the group. Rona added that the most important part would be the report followed by an action plan and its implementation. Terry Heyes would be hosting this event at Arnold’s Farm. Discussions had been held with the police to ensure there would be no problems with traffic etc. A risk assessment was in hand. Insurance was not a problem regarding the venue as Terry's company was covering that. The insurance of toilets was still to be checked. The deposit of £689 had been paid from BGRA funds. Volunteers would be needed to marshal and must be in place very early in the day. Posters and fliers were being ordered. Any ideas were welcome for placing posters. It would be necessary to sell 180 adult tickets to cover costs. Rona thanked Terry for taking on such an ambitious project. The next event was to be on April 13th when a murder mystery evening would take place including a 3 course meal. Tickets were on sale priced at £15 per head. Andy said everyone was waiting for the outcome of the judicial review. That could change everything or nothing. A meeting had been held with Jeremy Wright the previous week. The general feeling was that the Secretary of State was unlikely to consider a tunnel and so thoughts must now turn to what to do post-HS2. Rona suggested a letter should be sent to Eric Pickles, Secretary of State for Communities and Local Government, regarding the integrity and sustainability of community. 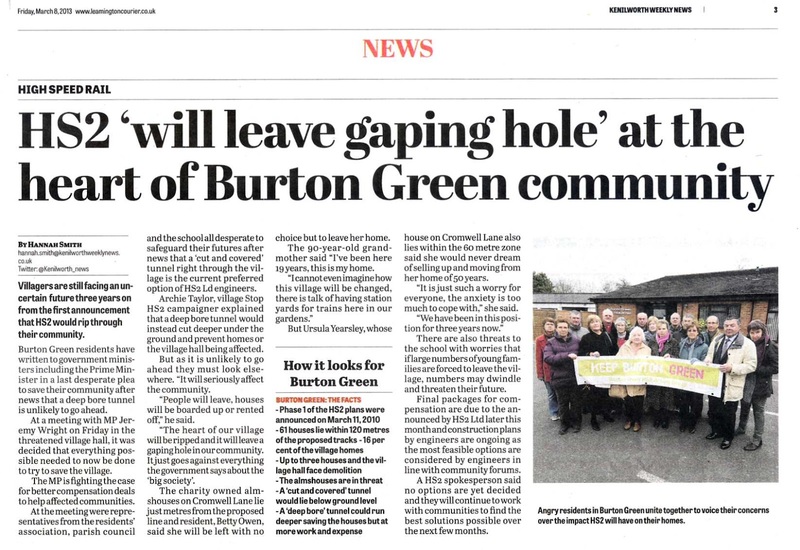 Andy said options if the tunnel was turned down included launching our own judicial review and funds were available to help with this if it was felt Burton Green had been treated unfairly. Another option was to respond to the environmental statement at the end of May saying a tunnel was vital. A petition could be made against the hybrid bill but by the time the hybrid bill was published, much damage would have been done already because of people leaving the community. Rona thanked the Action Group for all its work over the past 3 years. Cllr Taylor had sent a written report. The Council was considering the Neighbourhood Plan and possible future housing. Stephen Hay of Warwickshire County Council had attended the recent meeting. Grit bins had been delivered and John Levett and Tony Cotterell had agreed to take charge of grit distribution at the relevant junctions. The Annual Parish Meeting was provisionally planned for May 10th when residents would be invited to attend. Terry reported that he had now looked at the bank statements and matched up invoices etc. £285 had been paid out without a paper trail. The bank accounts had been reconciled and ledgers prepared from September 1st 2012. Online banking had been applied for and would help ascertain amounts more clearly and accurately. As already reported a deposit of £689 had been paid to Odd Socks for the theatre production. Other ring fenced monies were highlighted. Subscriptions of £3 per household were to be collected from May 1st with the aim of completing all collections by the end of the month. Mary reported that the Peeping Tom had advertised by placing leaflets on cars in Tesco’s car park. She felt this was a good idea. It was thought an application might be made to the Waitrose green token scheme. It was suggested the Jubilee Group should ask different village groups what they needed money for rather than providing donations for unspecific purposes. The next committee meetings would take place on May 21st; July 9th; September 17th. The AGM was scheduled for October 7th. An article about the impact of HS2 on Burton Green was printed in the Kenilworth Weekly News, 8th March 2013.